Class is still thought of in today’s society, and I wanted to provide a glimpse into the reality of class differences. What if, after 16 years, you discover the man you love is not who he said he was? Kerry Reis’s Legacy Discovered explores how love can stand up in the face of class differences and mysteries. 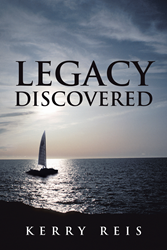 In Legacy Discovered, Ali and Ryan, together for 16 years, must overcome class differences when Ali discovers the truth about Ryan - he is not the man she thought she married. Instead of an orphaned child like herself, Ryan is son and sole heir of real estate magnate Charles Barnett who faked his death to escape his familial responsibilities. Now, Ali must battle societal pressures and a family legacy to reconcile her life with her new in-laws. Reis has always had a passion for creativity and entertainment. After 28 years of working in television, he decided it was the right time to explore writing. Kerry Reis currently lives in Colorado after living and working in Los Angeles in entertainment. After graduating with a bachelor’s degree in motion picture and television arts from UCLA, Reis worked with ABC Television, including Disney Channel and ABC Family, for 28 years. He is now happily pursuing his own adventures on the edge of the Rocky Mountains.